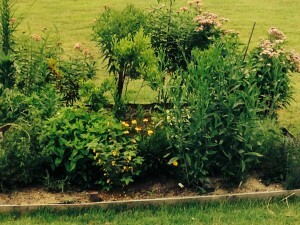 See all the posts in the Ocean Friendly Garden Category for this website by clicking here. Want to have a positive impact on the ocean? Start in your yard! By employing the techniques of Surfrider’s Ocean Friendly Gardens Program you can reduce the amount of wasteful runoff and harmful pesticides entering our waterways. Ocean Friendly Gardens promotes conservation, permeability, and retention (CPR) to revive our watersheds and oceans. It mimics nature and provides multiple benefits. Want to learn more or get involved in planting projects? 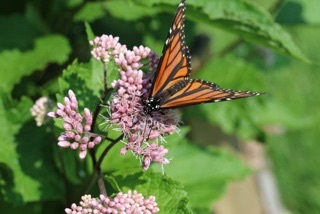 Email Bill, our Ocean Friendly Garden Coordinator at ofg@southjersey.surfrider.org. Bill has created Ocean Friendly Gardens at his own home along the Tuckahoe River. Each garden and rain barrel helps to get the water into the ground, to be naturally filtered and slowed, and not run directly into the river. The perennial garden is made of all native plants including bayberry, tickseed, cardinal flower, milkweed, coreopsis, joe pye weed, blueberry, ageratum, aster, salvia, partridge pea, daisy, and hyssop. 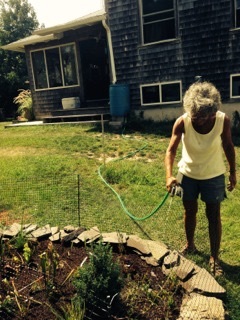 Watering the garden with stormwater, roof runoff, that was harvested in a rain barrel seen in the background. 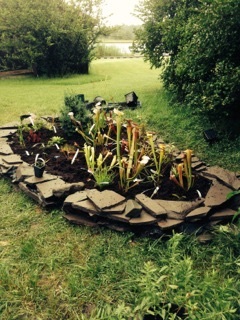 The bog garden is in a low area that takes the rain barrel overflow. Bog species are from the pine barrens, some are carnivorous pitcher plants. These plants provide habitat and food for insects and birds, and have attracted many species of butterflies.